Smoky Tofu Burger. 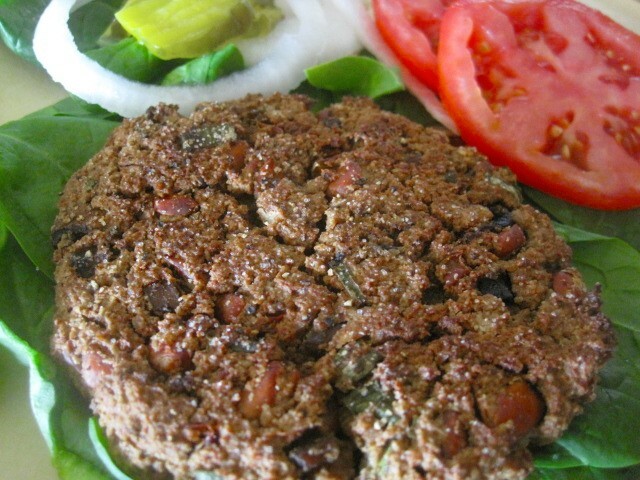 I have certainly made a lot of veg burgers in my plant based days. This one however is by far my new favorite. The smoky flavor, the texture, it is all spot on. At your next picnic or potluck, you could bake them in advance, then throw on the grill for just a few minutes each side to reheat. They will be the hit of the party! Preheat oven to 400 degrees F. Put the quick oats, nutritional yeast, vital wheat gluten, and walnuts in food processor or nutribullet and just pulse a few times until crumbly. Put your tofu and beans in a mixing bowl and add the liquid smoke, and seasonings. Use your hands and combine well. Add all the rest of the ingredients including the yeast/walnut mixture and stir very well or continue using your hands. Line a cookie sheet with parchment paper or silpat. Patty up big burgers, it should make about 4 good size burgers. Put in oven and bake for approx. 20 min, turn carefully then bake for approx. another 10 min until they are good and crunchy. Remove from oven and eat right away on a bun, without a bun, or crumbled over a salad. Without the walnuts, these are 235 calories ea, with walnuts 335 calories ea.